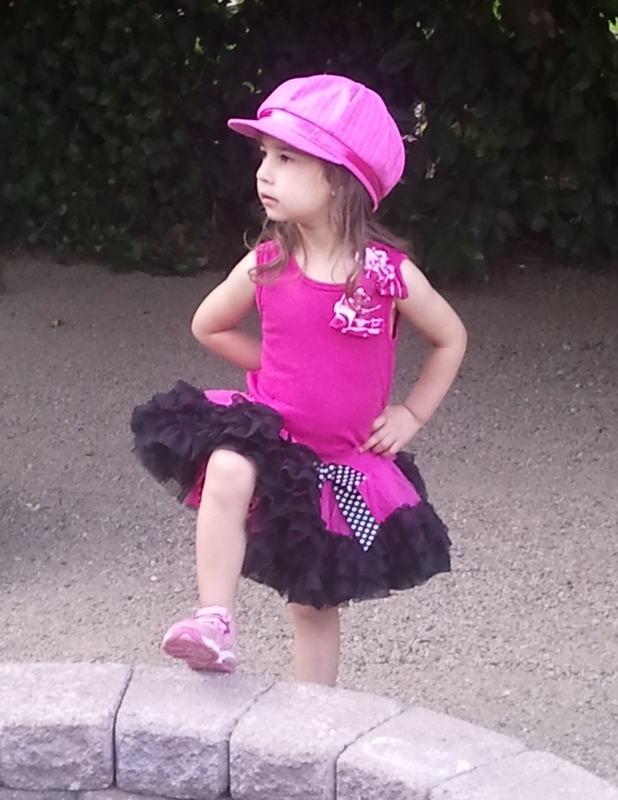 My little Wiggle Bean is rapidly growing in to a sassy pint sized fashionista with an attitude. Some times when you ask her how old she is, she responds back with 18! When you explain to her that she is only three and a half she replies back with yeah but then I am going to have a birthday and then another one and be 18. I really should start a book with all of her antics and the hilarious things she says on an almost daily basis, it could be a best seller in the humor category and the Parenting (or how not to parent) category. We have in-depth conversations about roasting marshmallows and making S’mores, she thinks everything that arrives in a box at our house is automatically for her, and she is smart as a whip when it comes to remembering things from weeks and even months ago (especially the things you want her to forget). She is extremely independent and wants to do everything on her own, her new favorite stance involves one or both hands/fists on hips. I am in for a world of hurt when she is a teenage, I have begun preparing myself already but doubt I will be fully ready when the time comes. Well guess what, It happened, I didn’t notice and now I have done it! THANKS BEAN! ME: Bean, time to get dressed. Would you like me to help pick out your clothes? BEAN: NO! but can you help? ME: (confused look on face because that was what I just asked) OK, do you want to wear shorts, a dress or a skirt? BEAN: Does that one twirl? ME: What top do you want? T-shirt or Tank top? ME: Well that wasn’t an option and you can’t wear a dress with a skirt. Do you want a T or tank? BEAN: I wore a dress and skirt to your friends! ME: (dang it why does she remember that now, and it was a cute outfit) Yes, but it will not work with this skirt. We then sort through just about every tank top in her closet (man this girl has a ton of clothes) before she finally picked a suitable one. I laid her full outfit on her bed, asked her if she wanted help (to which she replied no) and left her to get dressed on her own while I finished making lunch. About 10 minutes later she comes jumping into the dining room exclaiming “TA DA dressed”. I congratulated her, told her she did a great job and set her on to picking which of her many shoes she would wear that day. We finished our usual routine of hair brushing, teeth brushing, arguing over watching TV, and deciding on our accessories for the day (I told you she is a fashionista and rarely goes with out some type of accessory or another) and loaded up in to the car with Daddy for the ride to school. At this point everything seems normal, we get to school, unload from the car, get about half way up the ramp to the door and she starts snickering (never a good sign). ME: really? (checks, sure enough no underpants, just the shorts that are part of the skirt) Hon, I put them on the bed with your clothes, what happened? At this point I am mortified and imagining the call from daycare should we not have caught this “Um…… Mrs. M, did you know that Bean is not wearing any underwear today?” (uncomfortable silence). We have no time to go home, finish getting dressed and make it back so that my husband and I can get to work on time. Thankfully I remember that while she was potty training at the end of last year, I put a few spare pairs of underwear in her cubby at school for just in case purposes. I like your idea of writing a book I think that would be interesting to read. I just don’t know if that would sell well or not but if you don’t try you don’t know what might have been.